D800 or D800E? Here’s my results. 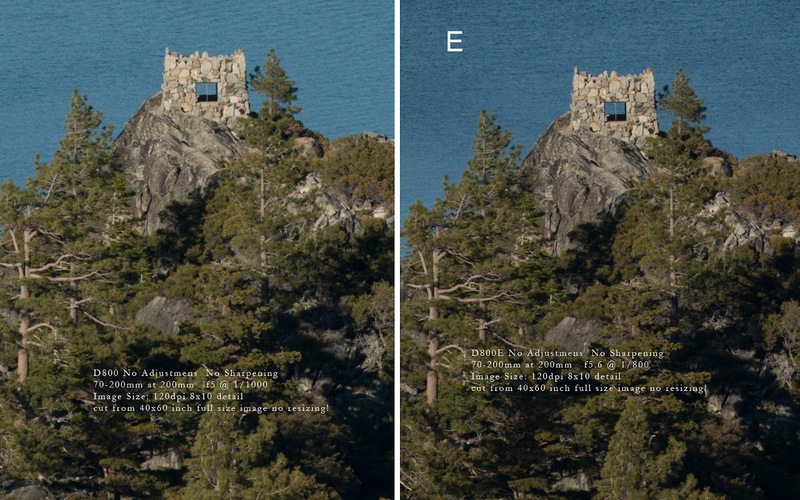 Are you confused reading everything on the internet about the D800 and D800E Nikon cameras? I was, so I set out to find the truth…for me. I’m a wildlife and landscape photographer and there are several challenges that one of these new Nikon bodies may help me with in future image making. Which, if either, is right for me? D800 or D800E? Which one will serve my needs best? I have a few questions that I want answered before I decide which one I should use. How much more detail is available in the E compared to the nonE in large prints? When and where in nature does moire’ appear, if at all? How can moire’ be removed in an image in post processing and which software will do the best job? Those are the basic questions of which I found no easy answer. Each answer led to more questions. I did get the answers I was looking for…eventually. Disclaimer: I am not a tech geek and with no disrespect to the techies, I don’t want to be. I don’t know all there is to know about diffraction, refraction, detraction, attraction, et al, but I do know image making. I do know what I like and how to get it without knowing all the techie stuff, although some knowledge of it is helpful, it’s what I see in the finished image that makes my day. I kept settings on both cameras identical. All tests were shot in raw, white balance set to 5500k, Aperture Priority and Manual exposure settings were used. I used two lenses during the tests. The 70-200mm f2.8 and the 200-400mm f4. The choice was based on the ability to mount either lens on a tripod and change cameras without moving the lens, the focus, or the zoom. It was also based on the fact that those are my most used lenses. Remember, I was testing for me. VR (vibration reduction) was turned off. All images were shot in RAW. 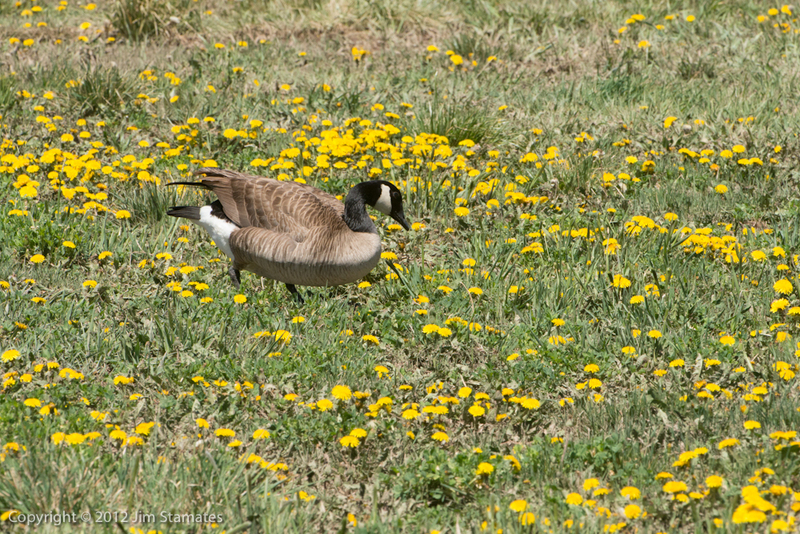 I used Lightroom 4 to import images. I set all LR adjustments to zero including sharpening and noise reduction. For some tests I set LR sharpening at default, +25. Camera Calibration was set to Adobe Standard and Process is 2012. If you don’t know about all this it doesn’t matter. What matters is that all compared side-by-side images were processed the same. That’s the important point. I was not trying to make one image look like the other, I was trying to see the difference when settings were equal. My assistant for the first series of test was Griffin Gregory, he did a terrific job in the field as well as with side-by-side image comparisons on the monitor. After an exhaustive first morning we found the D800E to be slightly sharper with slightly more detail in most of the images. There was one comparison where the D800 appeared to be better. That could be a result of operator error. The afternoon shoot produced some fantastic results. My wife Kathy and I headed out to Emerald Bay, Lake Tahoe for some side by side landscape images and here is where the E proved itself. I did not resize. I used the image size that came right out of the camera, 7360×4912. What ever dpi you choose for printing without resizing will determine the print size. Divide ppi by selected dpi equals image size. 7360ppi/240dpi=30inches 4912ppi/240dpi=20inches. 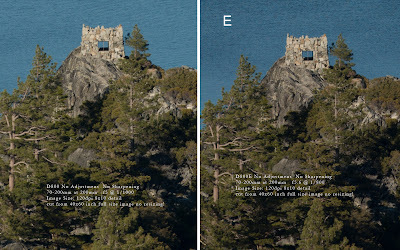 At full resolution without resizing at 240dpi you get a 20×30 print (rounded) from the 36mp sensor of the D800/E. At 120dpi you get a huge 40×60 inch print! Now before I get a lot of flack on 240dpi and 120dpi understand this; you can use what ever dpi you are comfortable with. I use 240dpi almost all the time when printing with my wide format Epson. Sometimes I use 120dpi if my image is really large. I can’t see the difference when the print is viewed at the normal distance for the size. (let’s not go there either) Please keep in mind, everything I am saying is what works for me. You may have different criteria and different needs. 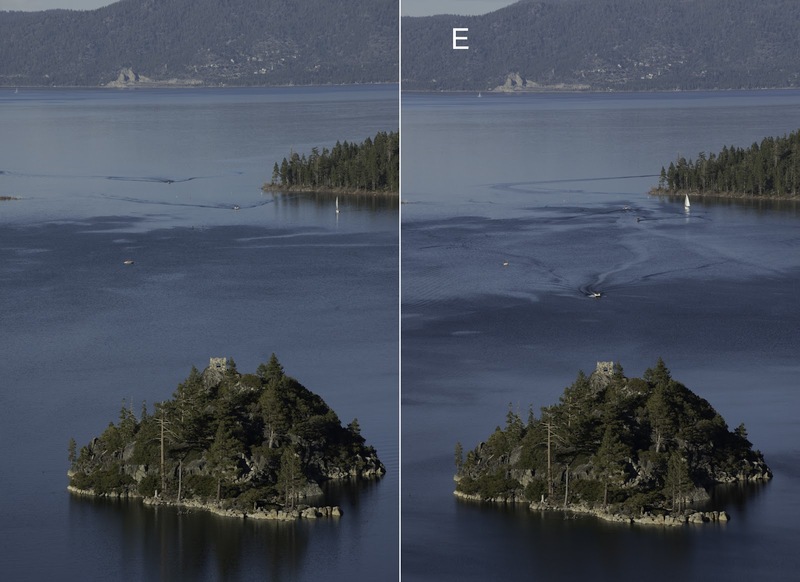 This side-by-side of Fannette Island is a crop from the images above. I took an 8×10 section of the tea house out of a 40×60 inch image size. I printed both and found the E to be noticeably sharper with more detail. You may not be able to see the difference as easily on your monitor. Thanks for the post, useful info. My only issue is the swapping of camera bodies on lenses mounted on a tripod. Good in theory but possibly not in practice. There are tolerances that are acceptable and every camera/lens combo is different. If you focus with one body, then swap bodies, your focus may not be exactly the same. Ideally, you fine tune focus for each lens you shoot with, or better yet use live view to manually focus each lens before a shot. As it stands, I don’t know if your results really are different because of the AA filter in the D800 or minor focus difference in your shots. Thanks Jim. I have not done extensive sharpness tests on my d800e yet but I did find that LR4 was not the best way to process the NEF files. I reluctantly downloaded the trial Nikon NX2 software and the update for he D800e from Nikon and all the CA issues improved and the images looked much better than photoshop or Lightroom conversions. 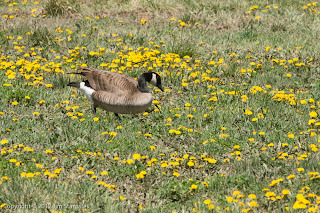 See my blog and Flickr photostream with samples. I was more concerned about moire. Search schafphoto for he various links. Mike, thanks for your comment. There are always going to be trade offs. I tested both ways, by shooting with one body focusing and then using both cameras to focus. But I think this system is better than having two lenses. There will apt to be more differences with two lenses than using one. Also, remember, I’m not a professional tester, I just play one on TV. I did these tests for myself and am sharing them here. You are right though, I did not fine tune the auto focus on either camera but it is usually pretty obvious if the lens is back or front focusing and I tested for that. I did not show all the images nor all the tests. Unknown; Thanks, I tried NX2 as well and as I said, these tests are for me and this is my workflow so it has to work for me using what I use everyday. I’ll check your blog.